One of our Facebook fans, John, shared a link to this all-transistor clock kit. That's right, this is a kit: 194 Transistors, 566 Diodes, 400 Resistors and 87 Capacitors. 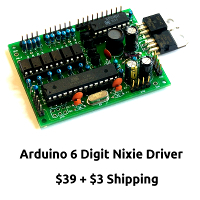 The PCB + components is $199 while the PCB alone is $100. For the amount of engineering that went in to this, it seems like a very reasonable price. (Besides, it isn't like I could engineer one of these. It isn't exactly an Arduino + LCD) While you're at his site, be sure to check out his TTL clock, microprocessor clock and calendars too.